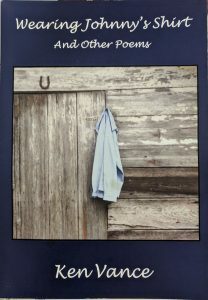 Allied Arts is hosting local author Ken Vance at Allen’s Market, located at 101 E McIntosh St, Milledgeville, on February 9th, from 7 p.m. to 8:30 p.m. He will be reading and signing copies of his new poetry collection Wearing Johnny’s Shirt and Other Poems. Ken Vance has been a Lawman for over 44 years; he served as City Councilman for the City of Milledgeville for 28 years and currently is the executive director of the Peace Officers Standards and Training Council of Georgia. His poems have been favorably critiqued by the Beat Poet, Allen Ginsburg. The reading will take place in Allen’s Market and a book signing and reception will follow in the Marlor House, across the street. The event is free to attend; copies of Wearing Johnny’s Shirt and Other Poems will be available for purchase.